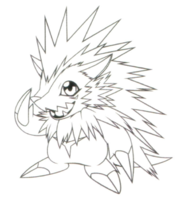 It is brimming with curiosity and will lose sight of its surroundings once it finds something to fixate on, although it is also highly cautious and will make its hard, needle-like quills stand on end when it is afraid, curling up into a ball until no sign of danger remains. 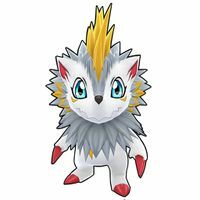 However, it gets very attached to those it has warmed up to, and will show them its favorite treasures that it keeps stashed in its fur. 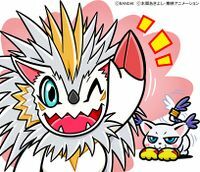 It seems to have a habit of going on guard whenever it spots a Tailmon, due to having been bullied several times in the past. 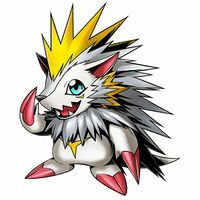 Its Special Moves are attacking the opponent by shooting lightning-coated quills (Lightning Fur), and curling its body up into a ball and charging forth (Kenzan Dive). An innocent Digimon who appears before the player, it barely knows anything about the Real World. 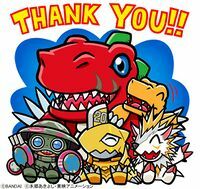 As it accompanies the player, it meets with all sorts of experiences and grows as a Digimon. The evolved form of Pusurimon. It barely knows anything about the Real World. 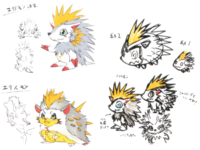 n., From hérisson 「エリスン Erisun」, which means "hedgehog". 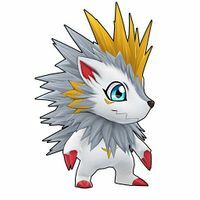 ライトニングファー Raitoningu Fā Shoots lightning-coated quills. ケンザンダイブ Kenzan Dive Curls its body up into a ball and charges forth. 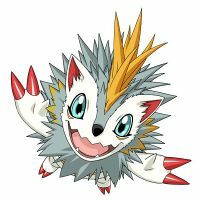 Herissmon is the main Digimon of the game. This page was last modified on 24 April 2019, at 23:47.